As a gourmet wine and food tourism destination Beaujolais is idyllic; the landscape is out of this world beautiful, referred to by many as the “Tuscany of France” – rolling hills and stunning valleys, speckled with striking chateaux and villages. Country inns, bistros, street cafés, wine cellars, and Michelin starred restaurants, there is a venue for every style and mood. And the best news of all is that the Beaujolais wines are just getting better and better. Gone are the days that light, fresh, fruity nouveau Beaujolais dominate. 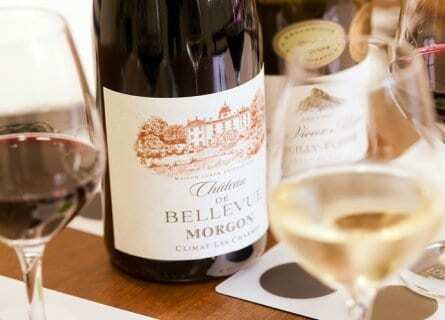 Although the nouveau wines still very much have their place, making, for example, perfect bistro wines and commonly feature in Lyon’s bouchons. However, especially in the north of the region (between Macon and Belleville) the majority of the Beaujolais-Villages and crus are found, as it is here that the rare combination of sandy clay soils over granite encourages the Gamay variety to express itself in a particular and unique manner. Stunning dense and structured reds are showing an ever increasing similarity to neighboring Burgundy in style and in their ability to age and not only remain fresh but improve. 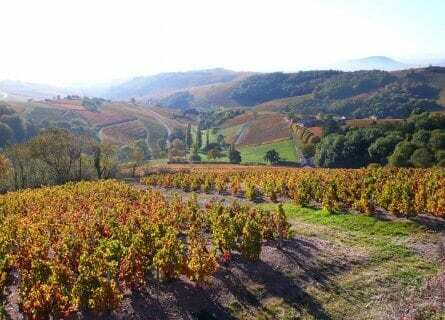 If you would like to discover some of the best, top quality Beaujolais this epicurean tour of the region is perfect. You will have a chauffeur-driven Mercedes throughout, stay in luxury chateaux accommodations and dine in some of the best eateries. As all Cellar Tours trips, everything is tailor-made and adapted to your needs, desires, group size and timing. Please contact us for more information on this experience. Pick up this morning at your hotel in Lyon or Lyon airport and head to the bewitching Beaujolais wine country. First stop is in Chasselay, just 20km north of Lyon this tiny village is home to the Guy Lassausaie restaurant and where an incredible welcome lunch will be waiting for you. Current owner and head chef Guy is the fourth generation of his family to lead this, now 2 Michelin starred eatery. You will feast on mouth-watering creations based on typical lyonnaise dishes with an exotic touch, perfectly paired with exquisite wines. After lunch, you will visit some of the most emblematic historic hamlets such as Anse, Oingt or Alix. A local guide will lead you through a great walking tour. Anse, historically important for defense is a fascinating medieval town, highlights include the chapel of Saint Cyprian and its modern spire, which despite only being erected in 2005 fits perfectly in with its ancient surroundings. 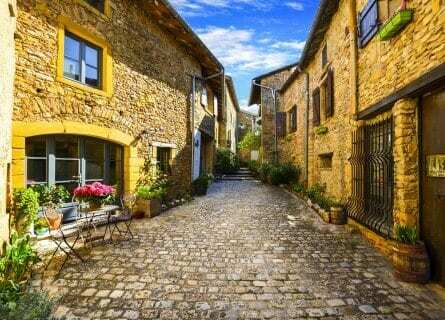 Oingt proudly holds the “Les Plus Beaux Villages” status; narrow cobblestoned streets are lined with elegant, golden stone houses and magnificently preserved monuments. In the early evening, settle into your fairy tale lodgings- a real castle dating back to the 13th century, amid vineyards and forests and lined with lavender. A delightful setting that will be your romantic abode for the duration of this tour, so make yourself at home and explore this wondrous castle. Go for a cycle or horse cart ride in the vines or stroll around the impeccable gardens, before enjoying some wine in the drawing room. Free evening to relax on site. We have an included dinner here on your last night. So you might just fancy some light nibbles tonight- you won’t be terribly hungry after lunch. After a leisurely breakfast, your chauffeur will be waiting to lead you to Château Thivin. Steeped in history, dating back to the 13th century, you will receive a private VIP tour with friendly hosts Evelyne and Charles Geoffray, who take great pride in sharing their experiences and stellar wines including Côte de Brouilly, Brouilly, Beaujolais Villages and Beaujolais roses from Odenas. Some of the most impressive examples of ancient practices, supreme terroir, and modern techniques. All of these fruity wines will undoubtedly have awoken your appetite, and lunch follows at Michelin starred Auberge de Clochemerle. Chef Romain Barthe leads the realm here. The pleasure and pride he takes in enhancing the flavors and textures of “nature’s gifts” as he refers to his raw ingredients are clearly expressed in each dish. Sit back and relax in the convivial and stylish dining room or join Romain and his team at the “host’s table” in the kitchen for an enjoyable behind the scenes experience. After lunch it’s a short 5-minute drive to nearby Salles-Arbuissonas-en-Beaujolais; a charming ancient town which dates back to Palaeolithic times. Some of the beautifully preserved highlights today include the 10th-century Romanesque cloister built by the Cluny Monks and the 11th-century church with its immaculate original door. 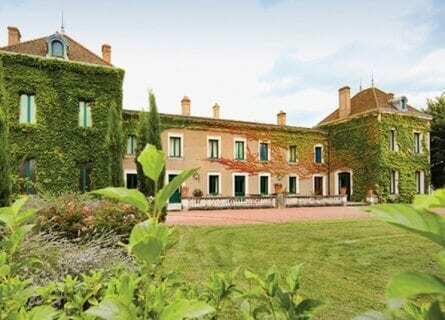 You will then move on to the lovely Domaine de Thulon in Régnié. Family run, husband and wife team Annie and René have further elaborated on their successful holding, expanding from the original 8 hectares to 17, producing award-winning wines including Beaujolais-Villages Rose, Beaujolais-Villages Rouge y Beaujolais-Villages Nouveau, White Beaujolais-Villages (Chardonnay) Regnie, Chiroubles, and Morgon-Charms. There is a strong emphasis on organic and biodynamic practices, with the next generation son and daughter; Laurent and Carine extremely hands-on in the business. Enjoy a private tour and tasting with your endearing hosts. Then it’s back to your heavenly château for a free evening, you might like to relax and unwind in the spa. You are in for a real treat this morning – a private visit to the gorgeous Château de Javernard. Not only is this one of the most picturesque estates in the region, owner Arthur Fourneau, and friend and business partner, Pierre Prost can be confident that they culture vines on some of the best terroirs of Chiroubles. The resulting wines are the definition of finesse. After a stroll around the stunning grounds, your tasting will include their white Macon-villages, Chiroubles Vielles Vignes and the very special Chiroubles Indigene. It is then just over a half an hour drive to Château de Buffavent; an elegant 16th-century country house surrounded by darling gardens. Admire the luscious vineyards that spread across the rolling hills as far as the eye can see, before sitting down to a wine tasting lunch in the stunning dining room or pretty terrace. Lovingly prepared local delicacies will be perfectly paired with their sumptuous wines. A digestive walk follows at Mont Brouilly, the striking Notre-Dameaux-Raisins Chapel perched on the top of Mont Brouilly is a must see, if nothing more than for the magnificent panoramic views. Reaching nearly 500m above sea level it provides the perfect look out over the Beaujolais wine country. The chapel was built in 1857 to provide protection to the surrounding vineyards and it is still very much a place of pilgrimage today. We have a magical finale to this idyllic day; sipping wine at the renowned Château de Pizay. Probably one of the oldest and most famous estates and now a beautiful hotel, you can wander around the immaculate gardens and relax on the terrace with a glass or two of their finest – santé! A free evening back at your hotel or taxi ride out with our suggestions. This morning you will visit the esteemed Château des Jacques; steeped in viticultural history and regarded for many years a top Beaujolais producer. This stature was enhanced by further improvements and innovation by owner Louis Jadot and winemaker Guillaume de Castelnau, who has been at the helm since 1996. Dense, concentrated, structured and capable of aging – truly some of the most majestic Beaujolais on the market. After such a scrumptious tasting you will be ready for lunch. Today your table awaits at Japanese/French fusion Michelin starred restaurant; Au 14 Fevrier – true art on a plate. The tasting menu is spectacular, each dish building on the “wow factor”. Such mouth-watering delights might include; “Grilled scallops with smooth egg yolk sauce scented with white truffle” or “Pan-seared duck foie gras wrapped in a red pepper crepe with fennel and mushrooms a la crème. Château de Juliénas is on the agenda this afternoon. Rich in winemaking heritage dating from the 14th century and today encompassing over 40 hectares of plots in Juliénas, Fleurie, and Moulin-à- Vent, making it the largest independent estate in Juliénas. You will receive a VIP greeting from hosts Thierry or Aurélia followed by a fascinating tour taking in the authentic 18th-century cellars and concluding with a tasting of some of their superior liquids. Then it’s back to your Château to freshen up for your farewell dinner at the remarkable Le 1217 restaurant on site. There is something quite special about the contrast of the intricately detailed, ancient stone walls and creative dishes that are presented in front of you. The perfect harmony of exceptional ingredients lovingly prepared and served in the most beautiful setting, washed down with some cracking wines of course! Beautiful Bellevue and Next Port of Call – Bon voyage! This morning you will have time to visit one more estate; the utterly delightful Chateau de Bellevue for a private tour and tasting. This quaint 19th century stately home has the prettiest of gardens from which you can look out over the village of Villié-Morgon. The tour will take in the impressive vatting room and cellars and finish with a tasting to include Château de Bellevue – Morgon as well as choice wines from their other estates in Fleurie, Moulin-à-Vent and Saint-Amour. Lunch follows at Les Platanes de Chénas, a delicious farmhouse lunch with a gorgeous view. Sit back, relax and savor the tasty regional dishes whilst admiring the stunning landscape from the tree-sheltered terrace. After a long, leisurely lunch, head back into Lyon for drop off at your hotel or next port of call. Alternatively, this trip could be extended to take in nearby Burgundy or The Rhône.